CMI installs specialty foundation and underpinning technology to stabilize and lift failing foundations to provide optimal structural solutions. With many years of experience in the foundation industry, the experts at CMI can provide you with the most cost-effective and proven solutions for your construction engineering problem. We have stabilized many structures ranging from, electrical duct banks to very large buildings using our counterforce underpinning systems. The underpinning process involves excavating to the bottom of the failing foundation and installing helical piles through the soil that caused the failure into stable material. The counterforce bracket system is then installed on the pile and attached to the foundation. Hydraulic jacks are used to lift the foundation to its original state, or stabilize it against future settlement. With the counterforce system, most structures can be lifted to their original elevation. 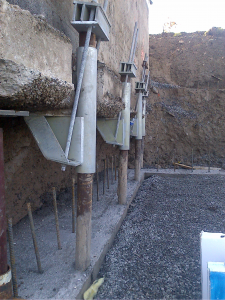 CMI uses compact equipment when installing Counterforce Underpinning Systems so we are able to work in very tight conditions without adding additional stress to the foundation. 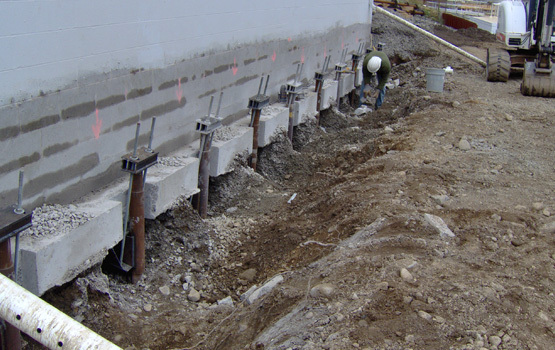 Call (888) 300-3936 today for more information on our foundation underpinning services or to discuss your project. How Crucial Are Geotechnical Surveys?